AMMONNEWS - A black superhero action flick. A film about an indigenous maid in Mexico. A portrayal of a gay, immigrant rock star. Spike Lee’s first Oscar. 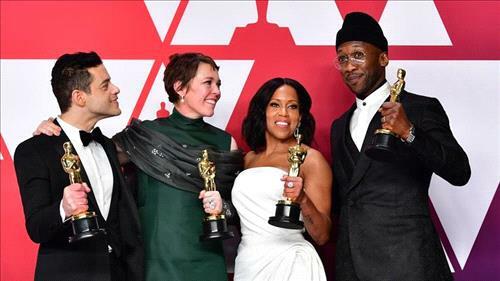 The 2019 Oscars were a win for films telling stories from a range of racial and cultural perspectives, marking a major shift three years after the movie industry’s top awards show was slammed for overlooking work by nonwhite artists. “Green Book” won three awards, as did “Roma,” a black-and-white, Spanish-language film about an indigenous housemaid, and “Black Panther,” a Marvel superhero movie with an almost entirely black cast. Spike Lee’s “BlacKkKlansman,” about a black detective who goes undercover with the Ku Klux Klan, also was honored. “It’s a real breakthrough that any film about race gets to win,” Kevin Willmott, who is African-American and was one of the “BlacKkKlansman” writers who won an Oscar for the screenplay, said backstage. Mahershala Ali, one of the stars of “Green Book,” was one of two black actors to claim acting prizes, taking home the best supporting actor trophy. Regina King, who played a protective mother in “If Beale Street Could Talk,” claimed the supporting actress award. Rami Malek, whose parents immigrated from Egypt to the United States, took home the best actor prize for his turn as Freddie Mercury in “Bohemian Rhapsody.” He noted backstage that as a child he felt skeptical about his prospects in Hollywood because of his cultural background. “I never saw anyone in a lead role that looked like me,” he said. Backstage, Lee sipped champagne and said he would not have won an Oscar on Sunday had it not been for the #OscarSoWhite campaign that erupted in 2015 and 2016, and for Cheryl Boone Isaacs, the former Academy president who oversaw efforts to diversify its membership. Backstage, however, he noted that Hispanic Americans are “really badly represented still” in film roles.